Hiring? Toptal handpicks top AngularJS developers to suit your needs. Eric loves to write code in a high-paced and challenging environment with an emphasis on using best practices. In this tutorial, the four functions that execute as a directive is created and applied to the DOM will be explored and examples will be provided. This post assumes some familiarity with AngularJS and custom directives. If you’re newer to Angular, you might enjoy a tutorial on building your first AngularJS app. There are many options that can be configured and how those options are related to each other is important. Each directive undergoes something similar to a life cycle as AngularJS compiles and links the DOM. The directive lifecycle begins and ends within the AngularJS bootstrapping process, before the page is rendered. In a directive’s life cycle, there are four distinct functions that can execute if they are defined. Each enables the developer to control and customize the directive at different points of the life cycle. The four functions are: compile, controller, pre-link and post-Link. The compile function allows the directive to manipulate the DOM before it is compiled and linked thereby allowing it to add/remove/change directives, as well as, add/remove/change other DOM elements. The controller function facilitates directive communication. Sibling and child directives can request the controller of their siblings and parents to communicate information. The pre-link function allows for private $scope manipulation before the post-link process begins. The post-link method is the primary workhorse method of the directive. In the directive, post-compilation DOM manipulation takes place, event handlers are configured, and so are watches and other things. In the declaration of the directive, the four functions are defined like this. Commonly, not all of the functions are needed. In most circumstances, developers will simply create a controller and post-link function following the pattern below. In this configuration, link refers to the post-link function. Whether all or some of the functions are defined, their execution order is important, especially their execution relative to the rest of the AngularJS application. Consider the following HTML snippet with the directives parentDir, childDir and grandChildDir applied to the HTML fragment. The compilation phase occurs first. Essentially, the compile phase attaches event listeners to the DOM elements. For example, if a particular DOM element is bound to a $scope property, the event listener that allows it to be updated with the the value of the $scope property is applied to the DOM element. The process of compilation starts with the root DOM element from which the AngularJS application was bootstrapped and traverses down the branches of the DOM using a depth-first traversal, compiling a parent first then its children all the way down to the leaf nodes. Once compilation is complete, directives can no longer be added or removed from the DOM (although there is way around this by directly using the compile service. The next phase is the calling of controllers and pre-link functions for all directives. When the controller is called, the $scope is available and can be used. The $element injected into the controller contains the compiled template but does not include the transcluded child content (transcluded content is the content between the start and end HTML tags on which the directive is applied). By definition, controllers in an MVC pattern simply pass the model to the view and define functions for handling events. Therefore, the controller of a directive should not modify the DOM of the directive for two reasons: it violates the purpose of the controller, and the transcluded child content has not been added to the DOM. So what does a controller do beyond modify the $scope? The controller allows for child directives to communicate with parent directives. The controller function itself should be thought of as a controller object that will be passed into the child directive’s post-link function if the child directive requests it. Therefore, the controller is typically used to facilitate directive communication by creating an object with properties and methods that can be used by its sibling and child directives. The parent directive cannot determine whether a child directive can require its controller, so it is best to limit code in this method to functions and properties that can safely be used by child directives. After the controller function, the pre-link function executes. The pre-link function is mysterious to a lot of people. If you read much of the documentation on the Internet and in books, people write that this function is used only in rare circumstances and people will almost never need it. Those same explanations then fail to give an example of a situation where it could be used. Some experienced AngularJS developers would say this private code could still be placed in the controller and then not called by the child directives. That argument would hold true if the directive will only be used by the original developer who coded it but if the directive is going to be distributed and reused by other developers then encapsulating private code in the pre-link function could be very beneficial. Since developers never know how their directive will be re-used over the course of time, protecting private code from being executed by a child directive is a good approach to directive code encapsulation. I consider it to be a good practice to place directive communication public code in the controller function, and private code in the pre-link function. Like the controller, the pre-link should never do DOM manipulation nor execute a transclude function, since the content for child directives has not been linked yet. For each directive, its controller and pre-link function executes before the controller and pre-link function of its child directives. Once the controller and pre-link phase for all directives is complete then AngularJS begins the linking phase, and executes the post-link functions for each directive. 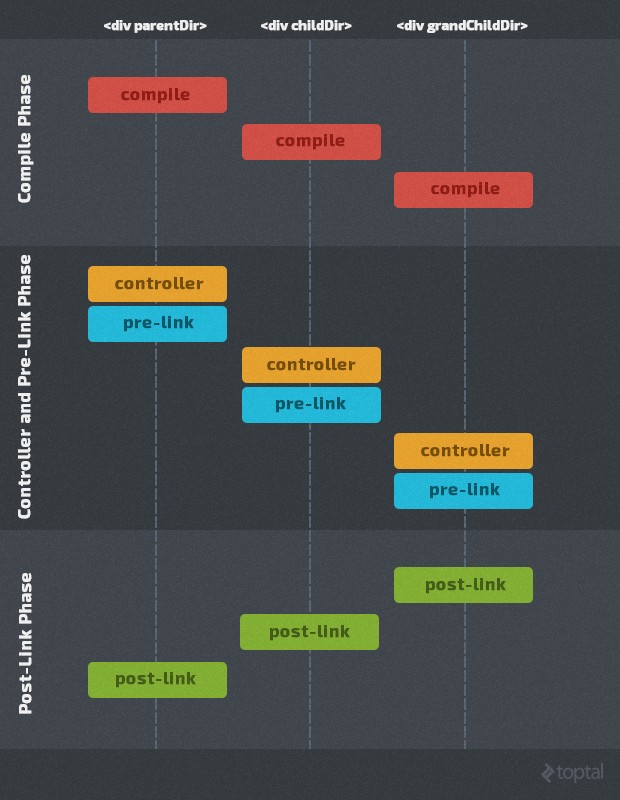 The linking phase runs opposite to the compile, controller and pre-link execution flows by starting with the leaf DOM nodes and working its way up to the root DOM node. The post-link DOM traversal follows a mostly depth-first path. As each child directive is linked, its post-link function is executed. The code will not cause the HTML to change, but reassigning the string version of the DOM elements will remove all of the event handlers created during the compile process. Typically, the post-link function is used to wire up event handlers, $watches and $observes. Once all of the post-link functions are executed, the $scope is applied to the compiled and linked DOM structure, and the AngularJS page comes alive. Here is chart listing the purpose of each function, what is available when it executes, and best practices on how to use each function appropriately. 1 compile DOM has not been compiled but template has been loaded into the DOM element content area. Directives can be added and removed. DOM can be manipulated with both DOM functions and HTML string replacement. Transclude function is available but is deprecated and should not be called. Not available. Function cannot be called by child elements. 2 controller Compiled DOM element is available but should not be modified. Transcluded child content has not been added to the DOM element. No DOM changes should occur because this is a controller and transcluded child content has not been linked in yet. Transclude function is available but should not be called. $scope is available and can be used. Function parameters are injected using the $injector service. Function is passed into child directive linking functions and is callable by them. 3 pre-link Compiled DOM element is available but should not be modified because child directive DOM elements have not been linked in yet. Transclude function is available but should not be called. $scope is available and can be modified. Function is not callable by child directives. But may call the controllers of parent directives. 4 post-link Compiled DOM element and child directive DOM elements are available. DOM can be modified with DOM functions only (no HTML replacement) and only content that does not require compilation can be added. No adding/removing of directives is allowed. Transclude function is available and may be called. $scope is available and may be used. Not callable by directive children but may call the controller of parent directives. In this tutorial on AngularJS directives, we have learned about the purpose, execution order and overall capabilities and uses for each of the four directive functions: compile, controller, pre-link and post-link. Of the four functions, controller and post-link are the most commonly used but for more complex directives that need to have greater control of the DOM or need a private scope execution environment the compile and pre-link functions can be utilized. Quite good explanation of the dos and dont's of directives, I thought it was going to be something kinda like the bad stuff about using directives. Really nice article, good explanation about the order of the pre post compilation phases. Well, I learned a few new things today about directives. There's always something to learn with Angular. Great post, Eric. One little nitpick, though: it would be great if your "Directive Function Chart" was as responsive as the rest of the page! I suppose that's possibly a note for the folks maintaining the Toptal blog. Maybe add a responsive/collapsible table component of some kind? Here's why: I loaded up the page on my phone to read during my subway ride and really wanted to read that directive function summary but, regardless of how I flipped and swiped my phone, Chrome just wouldn't let me read past the "DOM" column. Had to wait to get back to my PC to finally read the whole table. And, again, really great explanation of how directives work. I'll be making some code changes based on what I just learned from your post. Thanks! Great post Eric! This is one of the most complete explanations of how the directive functions work that I've come across. Thanks for taking the time to share your knowledge. I agree. This happened to me as well. It would have been nice if I didn't have to wait to get to my laptop to view the entire table. Great content and delivered with a rare clarity... Thanks! Concise and elegant overview. Good job. I thought there would be some code examples that I can try out :) . Indeed a good article. great blog. Thank you for posting this! This is one of the best read on directives. However it would be great if you can touch upon directive transclusion. I know transclusion in itself is a big topic but if you could cover basics then the reader would be aware of the concept. Nevertheless this post is awesome. Haven't found any more clarifying and simplistic article on the custom directive's intriguing, and intimidating as well, concepts of Controller, Post-Link and Pre-Link. Thanks Eric. Hi Eric W. Greene, Thanks for sharing a great article on AngularJS!! I think there are lots of people who struggle to learn AngularJS. I have also tried my best to write on AngularJS about Top 10 Directives in AngularJS which will be helpful to people who are stepping into AngularJS. I will appreciate if you can take a few minutes to provide your feedback for the same, it would be a great help!! <a href="http://expertinangularjs.blogspot.in/2017/03/top-10-directives-in-angularjs.html">Top 10 Directives in AngularJS</a> Thanks a lot!! Its very well explained and helpful.